Mokoma released new music video. Finnish trash metal band from Lappeenranta – Mokoma just released new music video to the song “Kepeät mullat“. The song is a preview of the band’s upcoming album. Mokoma is one of the top Finnish bands singing in their native language. During years band released nine studio albums (and two acoustic) and became popular not only in their home country, but also abroad. New band’s release “Hengen pitimet” will be out on May 25th 2018 in Finland and Japan. Album was produced by well-known Swedish producer – Jens Bogren, who was working with e.g. : Amorphis, Amon Amarth and Opeth. KORPIKLAANI unveil music video for ‘Henkselipoika’ + 2019 European tour with TURISAS and TROLLFEST! 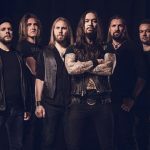 SOILWORK Begin Working On Brand New Album!